A number of years ago the Mayor of Fresno gathered a group of faith leaders and asked them a very provocative question; “What do you think is the role of faith institutions in seeking the economic well-being of a city?” Ask pastors and faith leaders what the spiritual needs of the city are or ask about the social needs of the city and they can talk until they’ve sucked all the oxygen out of the room. But ask about what faith institutions can contribute to the economic well-being of a city and you get nothing but blank stares. After that meeting I decided to gather a team of leaders ranging from businesspeople, to community benefit organizations, to pastors, and together we scoured the nation for models of churches doing job creation, job placement, and job readiness systems to help with hard to employ individuals. What we found was amazing; hundreds of modest but effective models of churches and faith based groups contributing to the economic transformation of their city. We took those findings and wrote them up in a book called The Work of Our Hands as a way to encourage the church and faith-based community in other cities to step into the same space. We also committed ourselves to applying what we had seen and learned to our own town of Fresno, California. Collectively, we committed ourselves to cultivating a faith-rooted social enterprise ecosystem for the well-being of our city, Fresno, California. We knew we needed a process that would stimulate an ecosystem. Only then would it be sustainable. 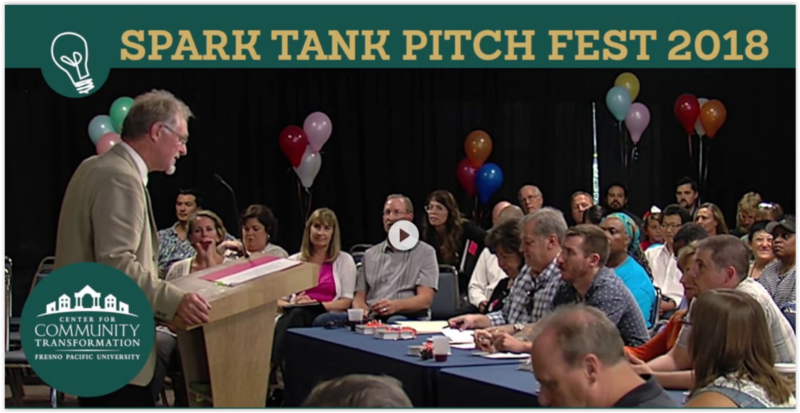 So, we launched an annual pitch fest and called it the “Spark Tank.” Think of it as Shark Tank without the teeth. Our aim was to help churches, faith-centered entrepreneurs and community benefit organizations explore and experiment with this idea of a Christ-centered business that would accomplish a social good. The first year we raised only $7,500. We made three awards that included an inner-city fitness club and a street level ad agency. The second year we raised about $15,000, and made seven awards. Year three it was $26,000 and 10 awards. We began to feel some momentum building. Now after 5 years, we’ve helped to launch about 38 small social enterprises with start-up investments. More than 20 are generating revenue actively right now. That’s a 60% success rate with the national average being right around 25%. That’s twice the national average. So what’s the secret? It turns out that churches with a vision for this can do all kinds of things to help a small business succeed. They help provide an instant customer base, access to experienced mentoring and accountability and small investors for access to the necessary start-up capital that all businesses need. 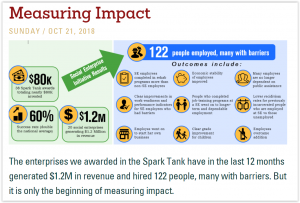 Just last year those 20 businesses generated $1.2 million in revenue and, even more importantly, hired 122 people who were hard to hire, people who have barriers to employment. That’s 122 people who have an economic solution in their lives, some who had formerly been incarcerated. Because now they have a job, they avoided recidivism, saving the state about $75,000 a year in costs of incarceration. That’s 122 families experiencing new levels of freedom, 122 churches seeing their contributions increase even by just a little. Let me share the story of just one of those families with a little red-haired boy named Jeremy. The gospel came to life for Jeremy at North Fresno Church. They were providing male leadership for him because his dad was in prison. One day he shows up at church with an older man and introduces him to the pastor as his dad. The dad’s name was Jeremy, also. Senior Jeremy said, “I just got out of prison, Pastor. Can you help me find a job?” The pastor said, “Well, why don’t you come work for us, because last year we started Rockpile Yard Service.” Two weeks later it came time to pay him, and they learned that he wasn’t banked, of course. They went down with him and got a bank account. He put his first paycheck in the bank. A couple of days later an even older man comes to church looking for Pastor Loren. Finding him, he asks, “What’s going on here?” Pastor Loren backs up a little and says, “Excuse me. What do you mean?” “Well, my son just got out of prison,” the older man said, “and every time that has happened before, he has reoffended within three days, but this time he’s got a job, and he’s got a bank account, and he’s got money. What’s going on here?” Soon after that, North Fresno Church had three generations worshipping, because the church was able to provide a job. What’s going on here? That’s a great question for all of us. Rockpile has now given work experience to nearly 2,000 men, half of which have gone on to full-time employment in better jobs. 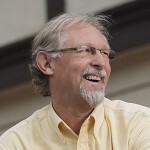 My challenge today to those of us in the church, and those of us in school, and in business is to at least ask the question: Could social enterprise be an alternate way to accomplish a particular ministry objective or meet a particular community need instead of fabricating yet another program or yet another non-profit? This may seem like a new world to move into with a layer of complexity that we don’t need right now. Believe me, I understand, but I would submit to you that some of our caution with regard to strategies like this come more from a lack of familiarity, not a lack of doability. The fact is we’re going to spend money anyway on our programs. We’re going to have to raise revenue anyway for our non-profit. Maybe we feel more comfortable with programs and organization, because that reflects our training and experience. But, what if we could depend on the skill and the knowledge sets that our parishioners employ every day in their work from finance, to accounting, to procurement, to staff development, to marketing and sales? What if they were in charge, rather than pastors, mission leaders and service providers? What if our job was just to bring resources together to provide covering, to be the cheerleader, to keep the enterprise focused on Jesus? We can do this. It’s being done all over the country by leaders who have discovered an approach that solves a community problem and that pays for itself. It’s so biblical. I’ll point you to 2 Kings 4, the widow and the oil. I dream that the faithful in every city can cultivate and release their natural resources and their talents to create ecosystems of innovation that will solve community problems and bring transformation. I dream that every city, all of our cities could be start-up cities for the sake of the Jeremys in our city. I hope you find yourself in that dream at some point.